One piece shower with 4 inch "classic tile" wall finish, 3/4" beveled threshold and center drain. Best Bath Systems One Piece 60" x 30" barrier free shower unit with 4 inch tile finish, 3/4" beveled threshold, and center drain. Ideal for adding accessibility during new construction our barrier free shower provides easy walk-in or roll-in shower access. Strong, luxurious polyester gelcoat composite fiberglass shower with "classic" tile look finish. Our composite wall system incorporates a plywood core on every unit. This solid wall system enables total freedom in placement of all accessories including seats and safety bars to individual needs. 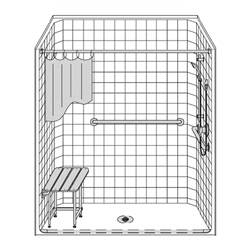 Price is for the shower unit only, all accessories are priced separately. Dimensions: 60" x 30" x 77-1/2"